Televue Delos 10mm Eyepiece - 1.25"
This Tele Vue Delos Eyepiece has a 10mm focal length and is presented in a 1.25" format. Continuously adjustable height eyeguard system that can be locked in any position. This Tele Vue 10mm Delos Eyepiece achieves full field sharpness, virtually perfect f θ (theta) distortion mapping, and color neutrality. Delivers 20mm eye-relief and a realistic 72° apparent field of view. 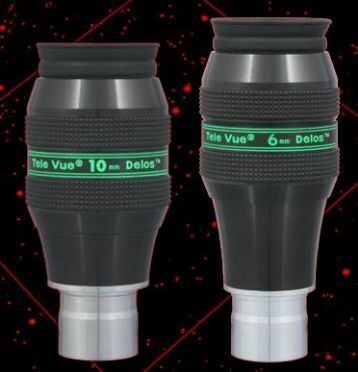 Tele Vue is pleased to introduce the Delos, mid-to-short focal length line of 20mm eye-relief, 72° apparent field of view eyepieces. Every optical, mechanical, and ergonomic aspect was rethought to achieve reference-standard performance for any visual application. The Delos was conceived as a narrower field Ethos. Reducing the field to 72° allowed freedom to increase eye-relief, while controlling pupil aberrations, all without making the eyepiece too large. With Ethos performance standards as benchmarks, the Delos design achieves full field sharpness, virtually perfect f θ (theta) distortion mapping, and color neutrality. Image fidelity is maximized utilizing glass matched multicoatings and anti-reflection surfaces throughout the eyepiece. Contrast is further enhanced with a new, continuously adjustable height eyeguard system that can be locked in any position. Since the Delos eye-lens measures a quite large 35mm in diameter, preventing stray light from reflecting off the first surface and extraneous light from entering your eye pays off in a nice increase in perceived contrast. The eyeguard's sliding action allows for positioning the soft rubber eyeguard at the ideal height to suit the observer's preference. Indicator marks on the eyepiece body are handy reference guides for setting your perfect position. The eye-guard can also rotate for Dioptrx users.